Here are two more monster illustrations from Return to Exile. 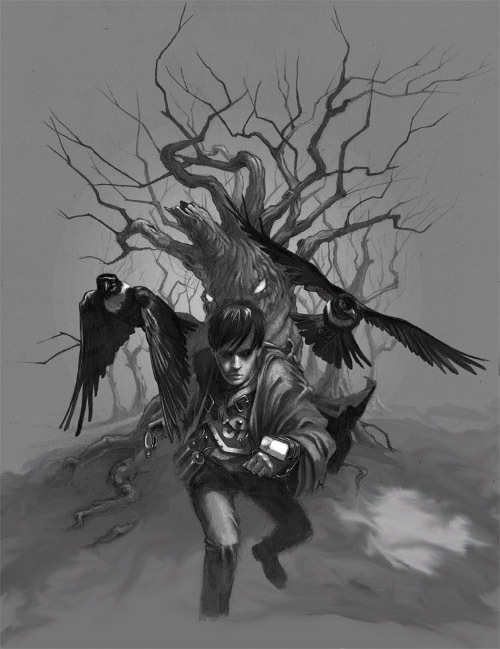 The first comes from the book cover and was illustrated by John Rocco, the artist behind most of Rick Riordan's books, including Percy Jackson, The Kane Chronicles, and the soon to be released Son of Neptune from the Heroes of Olympus series. If you're wondering why I list John's credentials every time I mention his name, the answer is simple: search engine optimization. It's lame, I know. The second illustration was done by Jeff Brimley, who did the Shadow Warg illustration I posted a few weeks ago. 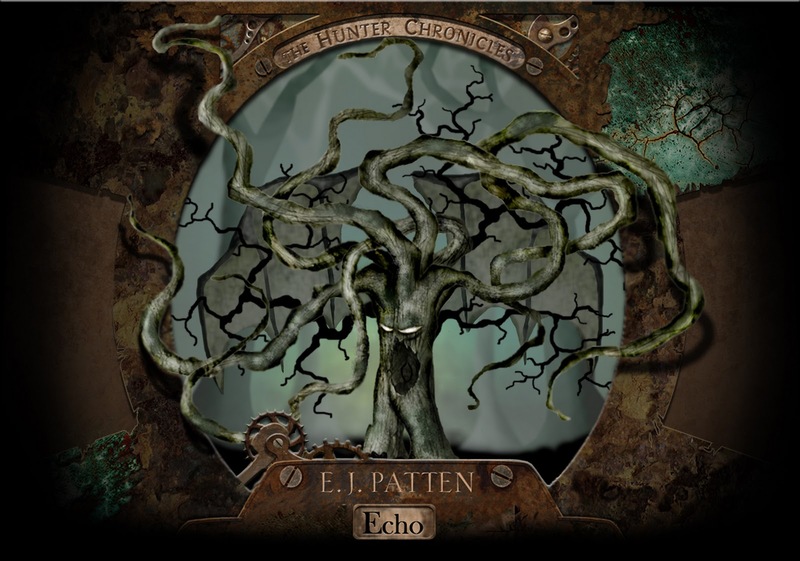 These illustrations show two very different takes on a treelike creature called an "Echo." The Evil Echo of Solomon Rose describes Echo as vaguely treelike, with large black leathery wings that fold out of their trunkish bodies. Their branchy arms can be inflexible as iron one moment, and slithery as tentacles the next, and when the wings spread out, the branches sweep downward into a rickety, protective shell. Or, if they choose, outward like writhing spears to flay and terrify those below—a tree one instant, a nightmare with wings the next. Great pupil-less white eyes run half the length of the trunk—or at least, they did until Solomon Rose gouged them out, one by one, when the Echo refused to follow him against a monster he claimed would destroy the world. 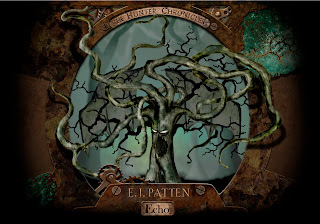 Robbed of their sight, Echo began to “see” through highly sensitive organs in their branches and mouth—tasting the scents, and sights, and emotions around them. Echo keep to themselves, hiding in the old, dark forests of the world. Tangled roots spread deep, deep beneath them, clinging to the roots of other Echo like children holding hands, and they spend days and nights lost in a haunting sort of collective dream. According to the Echo narrator of The Evil Echo of Solomon Rose, breaking an Echo from its roots ends the dream, effectively exiling the Echo, and is one of the cruelest things that can happen; it is also one of the best because a rooted Echo can’t fly, and flying, as the narrator claims, is a dream worth waking up for. Echo have highly sensitive sensory organs all along their limbs. So long as the limbs are flexible (i.e., not in protective mode), they can be attacked. At best, this will temporarily “blind” the Echo, giving you time to run. “Why callest thou me, thou thawing thorn? his evil echo slithered off to sleep. That's all for today. Once again, if you have a favorite monster you'd like to see illustrated, let me know! I like them both. The Echo I tried my hand at wasn't very good. I'd like to see a Gnomon, please! Or a Wargarou. The latter would probably be uber cool because of all the flames. Or maybe a book from the Monster's point of view!